Discussion in 'Server Announcements' started by KingGoldensPanda, Jul 11, 2016. The latest news is from bending, we have done some great improvements and I'm glad to finally announce them! 1. 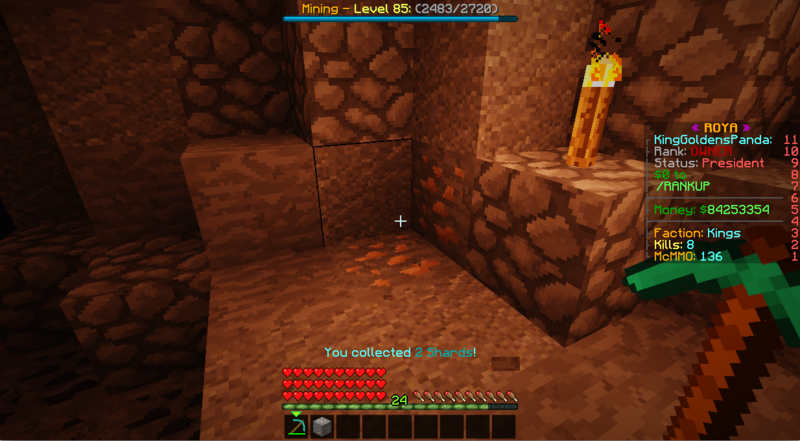 Auto Smelt - Automatically smelt ores to ingots, sand to glass, and nether rack to nether brick. 2. Jackhammer - Mine multiple blocks at one time. 3. Plant Breeder - When tilling the ground, you may see some seeds appear from a verity of plants! 4. Messenger - Increases your movement speed when you wear any boots. 5. Arrow Formation - Ability to shoot multiple arrows at once! 6. Piercing - Chance to bypass another players armor when in PVP. 7. Life Steal - Chance to copy the amount of damage done to a player, and turn it into health for yourself. 8. Frostbite - When in pvp, ice can magically appear around an enemy and freeze them for a few seconds! 9. 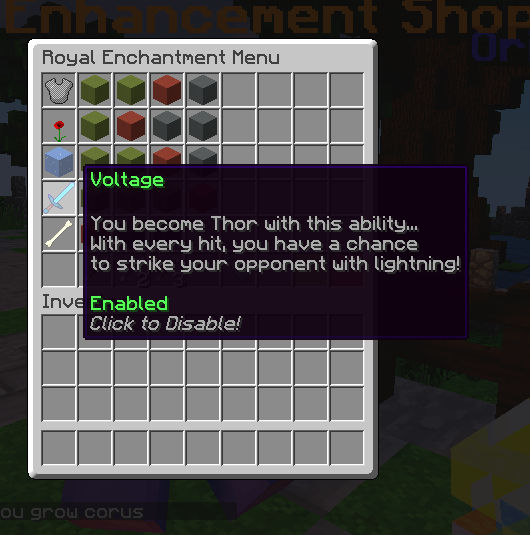 Voltage - Sometimes, you become Thor and strike opponents with lightning in PVP. 10. Wolf Tamer - When hitting an opponent with any weapon, wolves may appear and assist you in your battle! 11. After Effects - Chance to explode upon death and deal ample damage to surrounding enemies. 12. Savage - Mining fatigue and Levitation creates an interesting PVP battle! 13. Enemy Decay - Ability to sometimes give an opponent Wither and Poison effects in PVP. 14. Explosive Arrows - Arrows can now create explosions when you hit someone! 15. Mob Swatter - Chance to instantly kill ANY Mob! 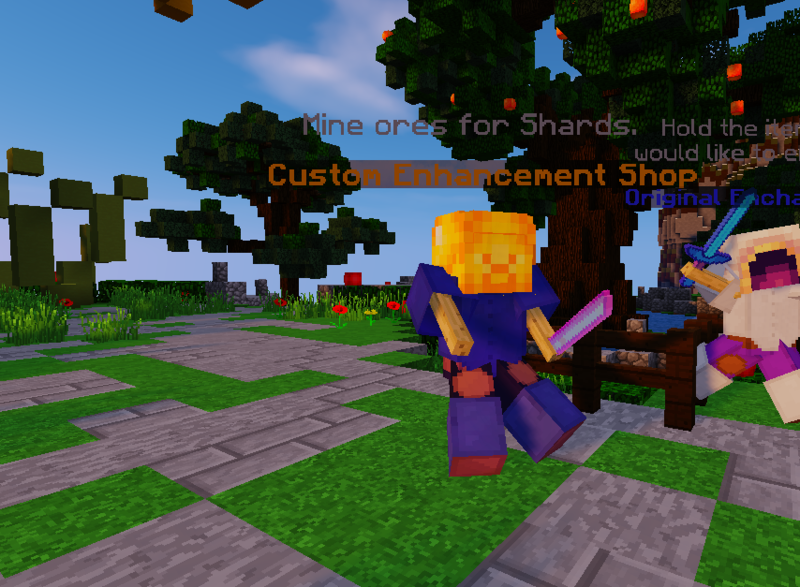 - You are able to purchase or upgrade these Enhancements at the /warp shop or alternately, you may use /shard from anywhere in Bending! - Each Enhancement has its own percent of happening, there is not a 100% success rate. That would be to powerful and crazy! Each Enhancement also has multiple upgrades you may purchase, which increases these percentages and also makes these abilities more powerful. 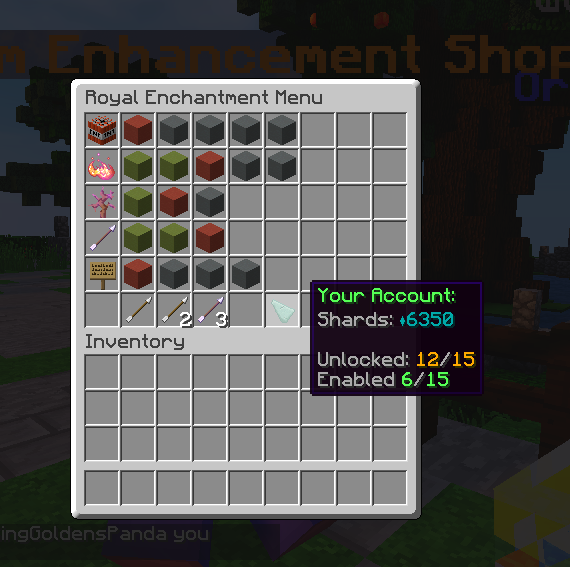 - Whenever you receive a Shard from mining an ore, you will be able to see how many shards you obtained by looking at the notification above your hot bar (where you hold items)! - Purchasing from the shop is very easy! If the Stained Clay is Gray, you cannot purchase it: this is due to either insufficient amount of shards or you haven't unlocked the previous upgrade. If the Stained Clay is Red, you can purchase the upgrade by clicking the block! 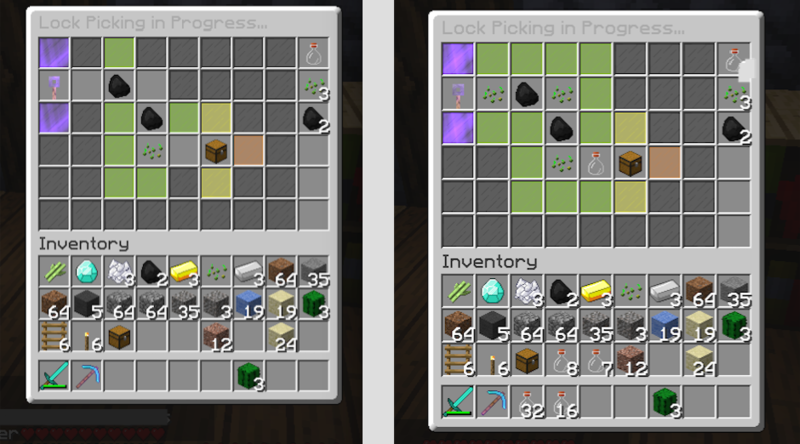 After purchasing an upgrade, the block will turn Green, symbolizing a Purchased Upgrade! 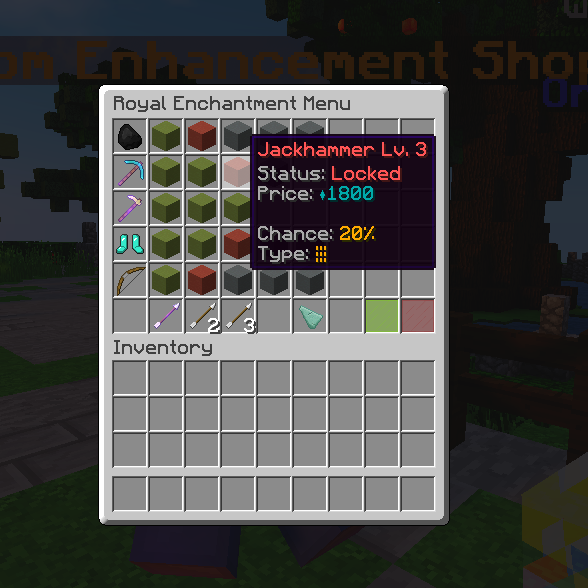 - Lastly for Custom Enhancements, we added the option to disable or enable the enhancement. You may do this by simply clicking on the item representing the Custom Enhancement! - Hope you enjoy these beautifully designed player enhancements! They are quite fun if i do say so myself Tell me your favorite Enhancement below! Mine for sure is Savage - Muhaha! - Next, is Lock Picking. Due to Bending being a Raiding and Greifing allowing Factions Server, we have received much feedback that breaking into a Private Chest, may create some interesting features! - Lock Picking is very simple to start, however the unlocking process requires resources from survival! 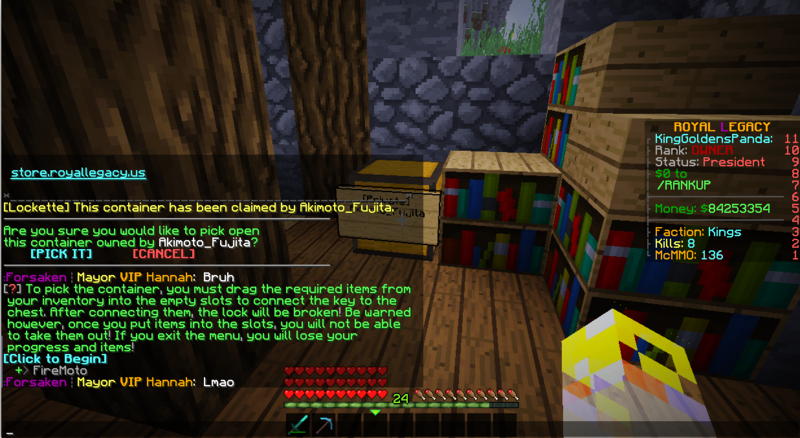 By simply right clicking on someone's Private Chest, a Big notification in chat will appear asking you to confirm weather or not you would like to continue breaking into the other player's chest. After you choose to Pick It (by clicking the button in chat) an informational statement will appear showing information about the process! We advise you to read this at least once, after you may click the chat button [CLICK TO BEGIN] and it will pull up the Picking Process! - The Picking Process is simple, you just must have the required resources in your inventory to complete this action. The required items to pick the container are listed on the right of the menu. By simply dragging and dropping the required items into the empty slots on the left, the surrounding glass will turn green showing you have put in the correct items! The order does not matter. 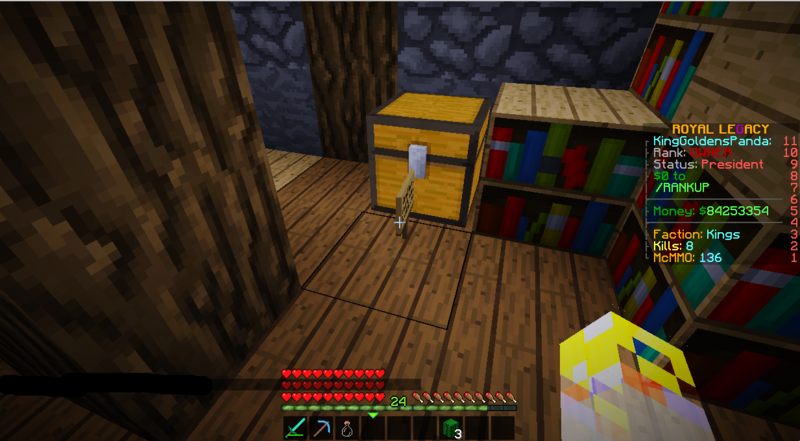 - After putting in all the required items, you will hear the lock being broken into if you have your Minecraft Sounds Enabled, and after the sign will break from the container and you are free to raid, so - happy raiding! I hope you enjoy these updates to Bending! A lot of work and resources have been put into use to create these new and unique creations! Leave me some comments and suggestions on thoughts about them! Don't forget to tell me your favorite Custom Enhancement ability in the Comments! More updates soon!